It’s time for Wichita Adore’s annual Event Offering to the Catholic Diocese of Wichita! This year we will once again offer No-Cost Events to any Parish within the Diocese. For the 2019 year, the Catholic Diocese of Wichita unveiled their theme: “Fully Alive.” Christ calls each of us to be Missionary Disciples of our faith, diving headlong into the love and joy that Christ offers to each of us in His Resurrection. It is our hope that by offering these events, we can help spark the flame of a lifelong relationship of walking with Christ, Fully Alive in His Life. Your Parish Selects an Available Date. WAM gets in touch with your parish and Priest. WAM provides Promotional Material Design for Your Event. WAM arrives at your parish a couple hours ahead of your Adoration Event for Set up. Adoration commences with Exposition and continues with an Hour of Eucharistic Adoration adorned by music and silence. If Confessions are desired, they are a great addition to an event! The Event wraps up with Benediction, a closing hymn, and a final prayer to close out the evening. 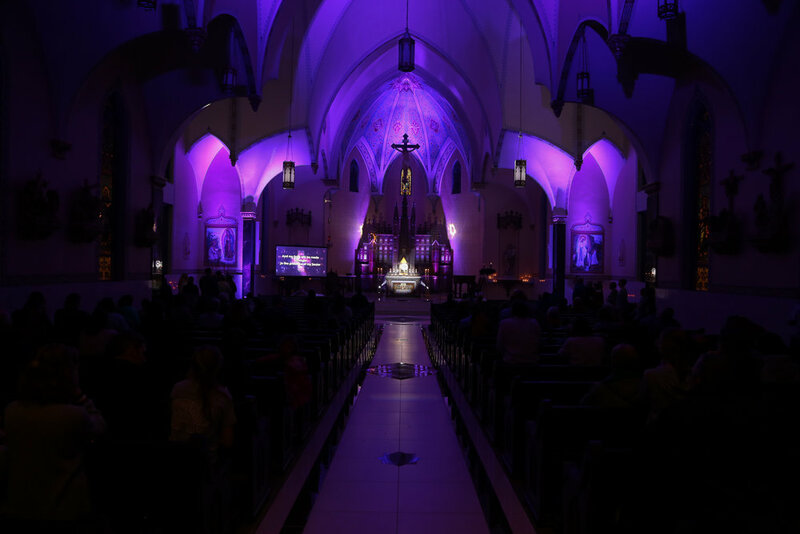 Wichita Adore will provide all the equipment and materials needed for Music, Lighting for the Church and Adoration, and extra hands to make sure things run smoothly all the way around. We’ll also provide professional photos from the event to be used in your bulletins, website, advertisements, etc. That’s all there is to it - we’ll take care of the rest! All we want is to help stir up the hearts of your parish to be fully alive in Christ’s Resurrection. Please - ask your priest before filling out the form below. It’s not our intent to force these events on anyone, and we want to give everyone an opportunity. If it helps, feel free to give us a call to discuss the flow of the evening. We’re available any time at 316-295-6805! We'll reach out to you as soon as we receive a request! Tell us what parish you're representing! If you have a particular one in mind! Otherwise, just select 'Don't Know!" February 11th, 2019 - Past! March 11th, 2019 April 29th, 2019 - Booked! May 20th, 2019 June 10th, 2019 - Booked! July 15th, 2019 August 5th, 2019 September 16th, 2019 October 7th, 2019 November 4th, 2019 December 16th, 2019 Don't Know! If you have any questions about this event, just ask! We'll answer them! Monday, February 11th, 2019 - Unavailable! Monday, April 29th, 2019 - Booked! Monday, June 10th, 2019 - Booked! There is a completely optional donation of $450.00 towards sponsoring another event at another Parish, but we will never allow money to deter us from doing a ministry event. So please don’t let this be a roadblock - we just want to give you the chance to help us spread the devotion to the Heart of Christ.